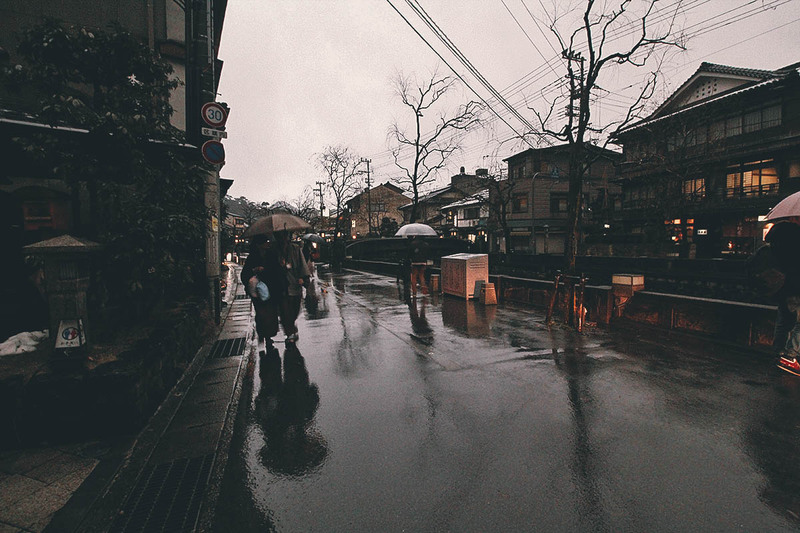 Kinosaki Onsen is captivating. 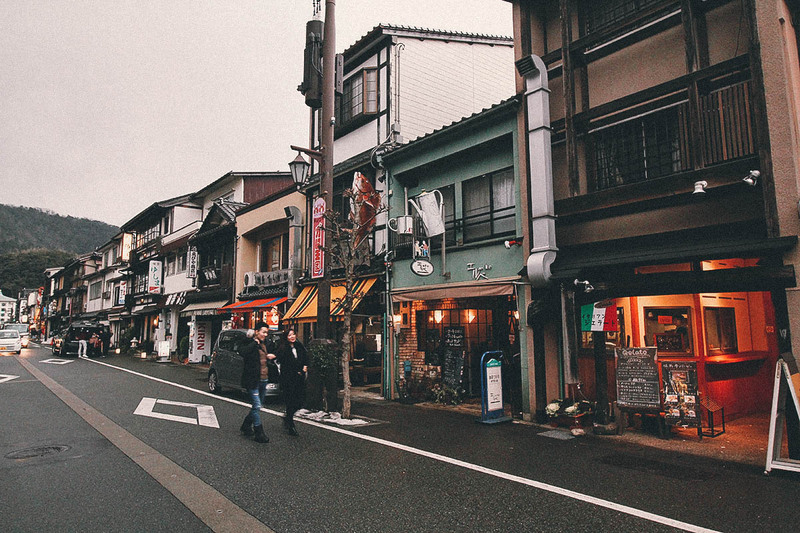 It’s one of those places in Japan that make you feel like you were in a different era. 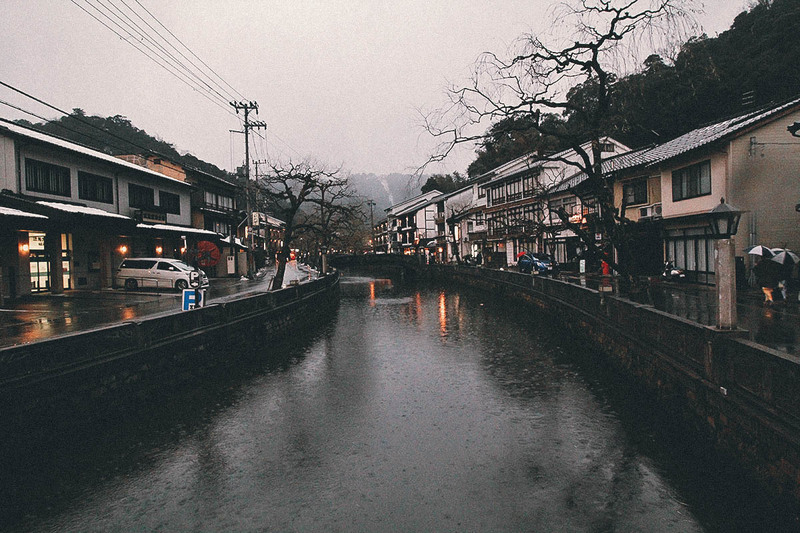 About two and a half hours northwest of Kyoto and Osaka, Kinosaki Onsen is an idyllic town known for its seven public hot springs or soto-yu. There are no modern hotels here. Instead, you’ll find traditional ryokans (traditional Japanese inns) and buildings just 2-3 storeys tall. The willow-lined Otani River cuts through the center of town and you can cross to either side on footbridges spaced every hundred feet or so apart. So preserved is the townscape that the only reminders of 2017 it seems, are the Japanese compacts navigating its narrow streets. There is much to be charmed by in this town but what struck me the most were the people. 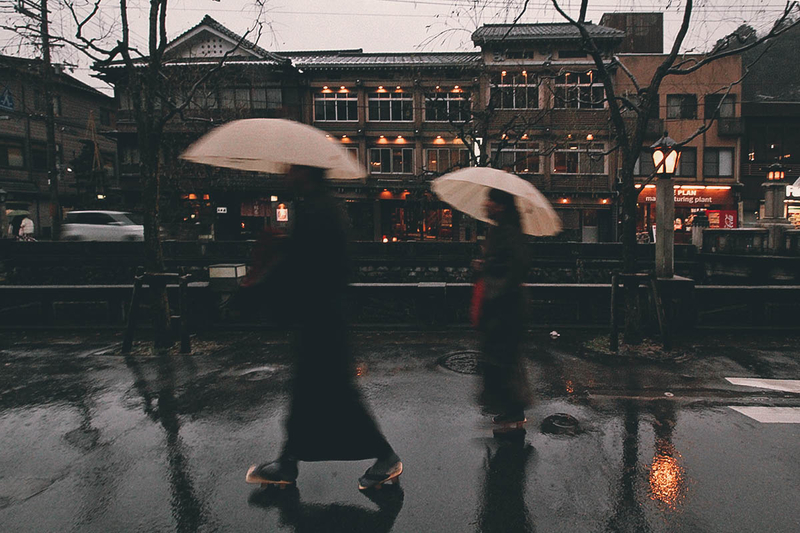 Many onsen-goers were walking around town in yukatas (cotton kimonos) and geta sandals (wooden clogs)! I thought yukatas were worn mainly in private quarters so it was a little surprising to find people wearing them in public. It all made sense when our tour guide explained to us the concept of an onsen town. As she put it, the entire town is a ryokan. The inns are the guest rooms, the hot springs are the baths, and the roads are the hallways. When you’re here, you can relax in a yukata even when outside because the whole town is like one big ryokan. I wish we could have stayed the night here. The town was so picturesque and rife with detail. One of the seven soto-yus. See what I mean about the onsen-goers walking around in yukatas and getas? Furthering the “ryokan town” concept, staying at any Kinosaki Onsen inn entitles you to free access to all seven hot spring baths. If you’re visiting just for the day, then you can purchase a Yumepa pass which allows you to bathe at all seven soto-yus for JPY 1,200 for adults and JPY 600 for children. 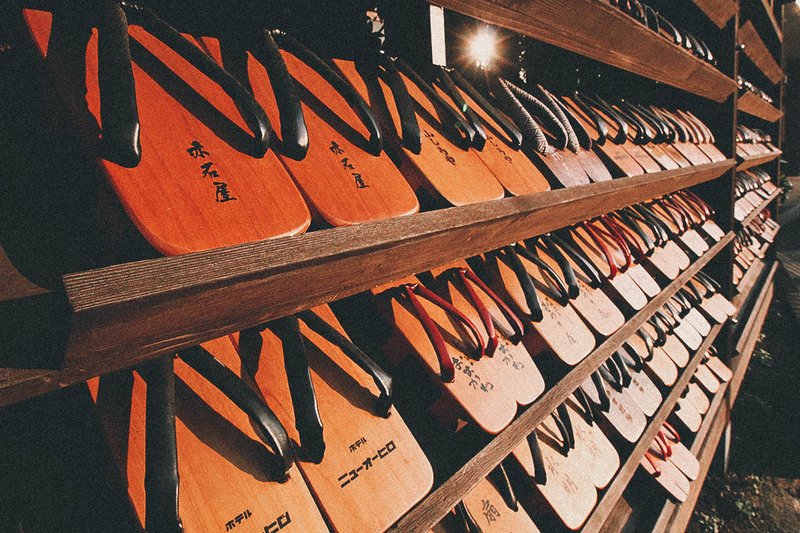 A closer look at the wooden geta sandals. Some of the onsen-goers were walking slowly and with measured steps so I’m guessing these take some getting used to. Shops, cafes, and restaurants. As previously described, there are no tall buildings here. 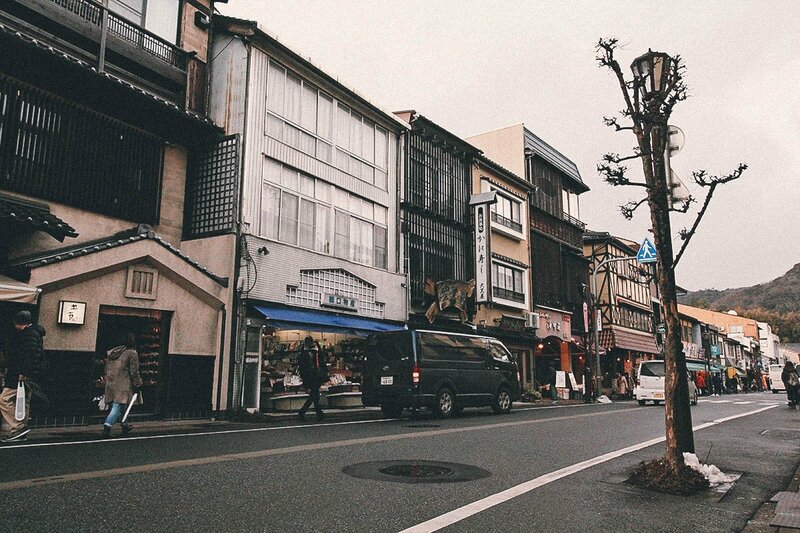 With more time, I would have loved to explore all the shops and alleys. The whole town has so much character. 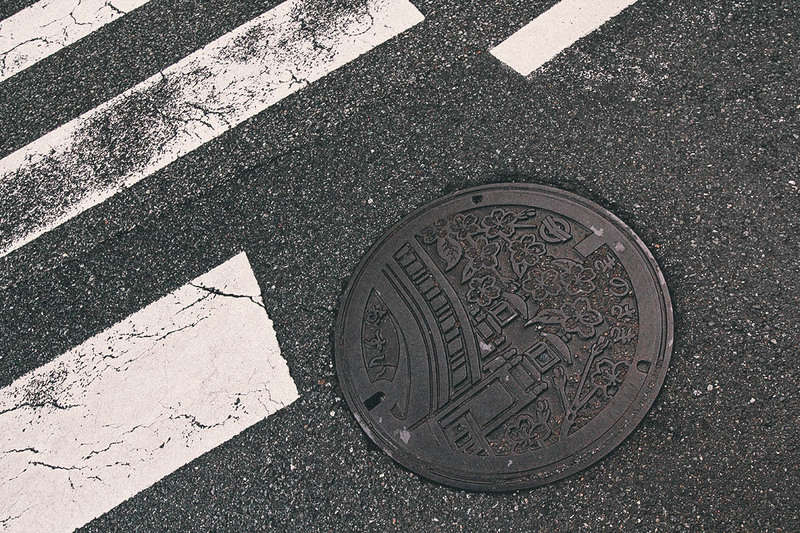 Even the manholes in Japan are kawaii. I read about artists in Berlin who use the silkscreen process to transfer urban designs from manholes and grates onto shirts. They should do a series on Japanese manholes! 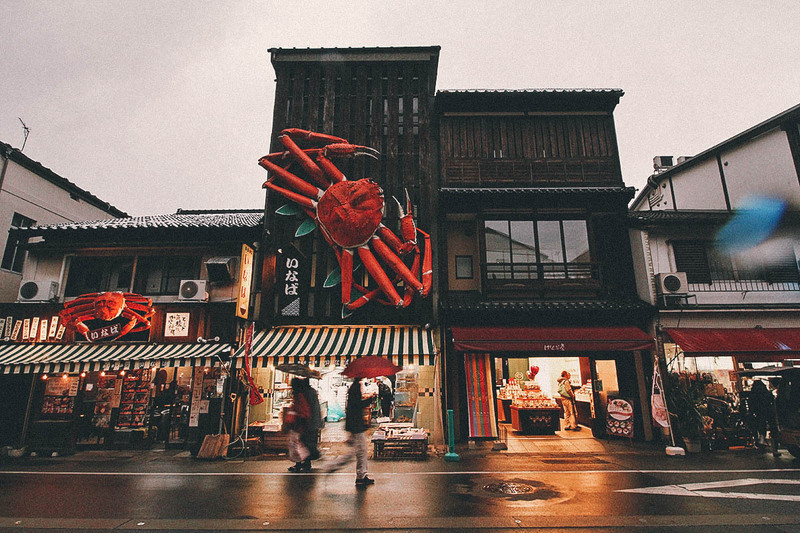 Kinosaki Onsen is by the coast of the Sea of Japan so Matsuba Crabs are popular here. Matsuba Crabs are male snow crabs fished from the Sea of Japan. They’re said to be some of Japan’s very best. 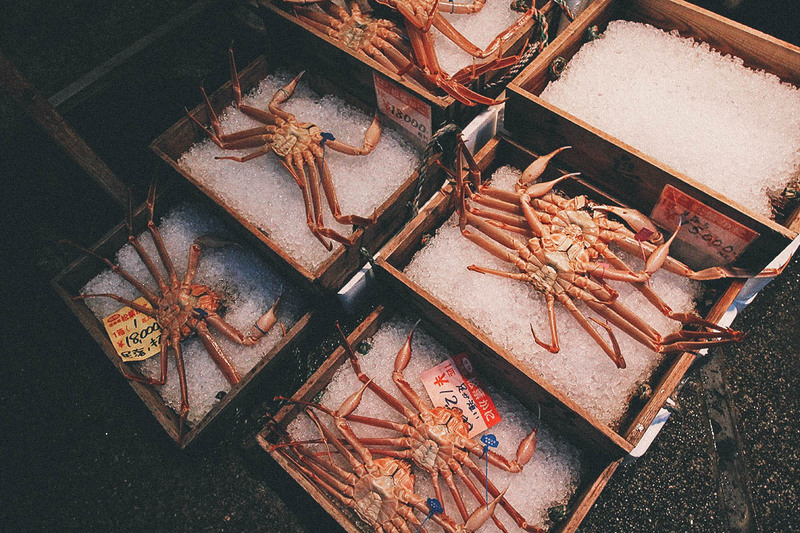 Matsuba Crabs are prized delicacies so they don’t come cheap. Is that JPY 18,000 (around USD 160) for a single crab?! 😯 We were lucky enough to have these prized crabs for dinner at our inn later that night. It was served hot pot style and you could have the crab fully cooked or still partly raw. It was sooo good. 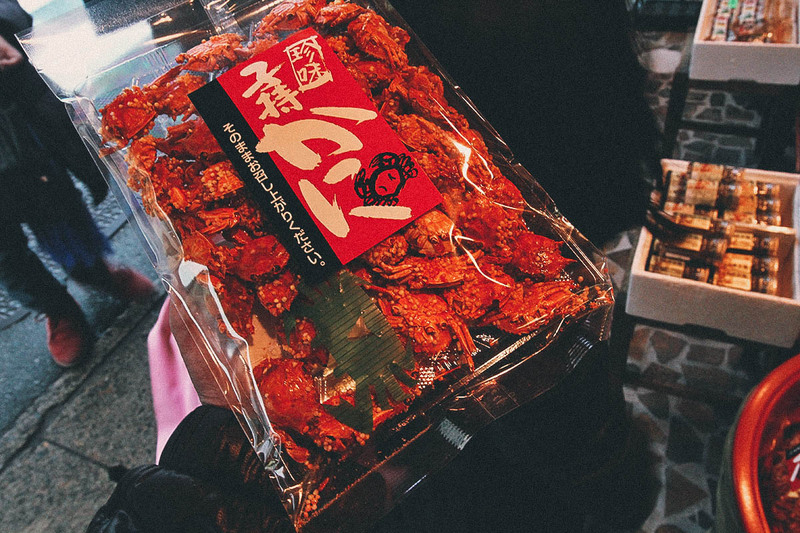 You can find all kinds of crab products here, even bags of whole crablets to be enjoyed as snacks! 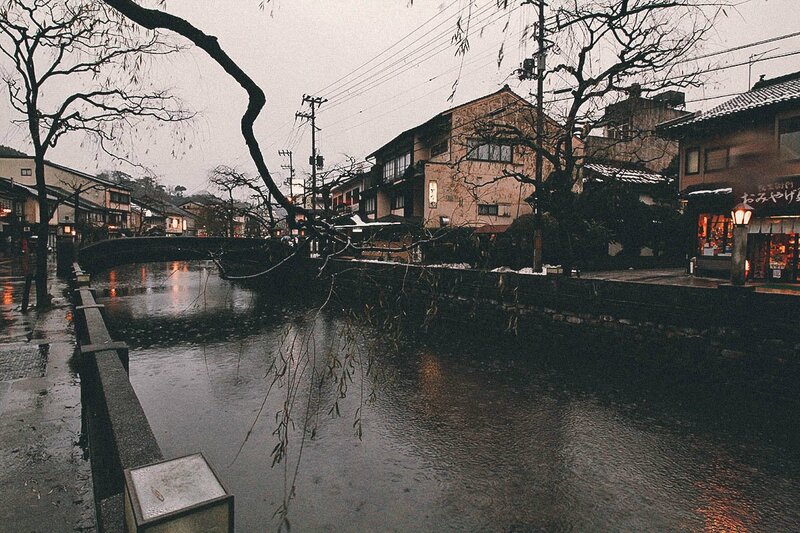 The Otani River cuts through the heart of town. As you can see, it started to rain while we were there creating an even lovelier atmosphere. We left town just before it got dark. As pretty as the town was during the day, I can only imagine how beautiful it must be at night with all the lights. Our group of bloggers/media taking refuge from the rain. 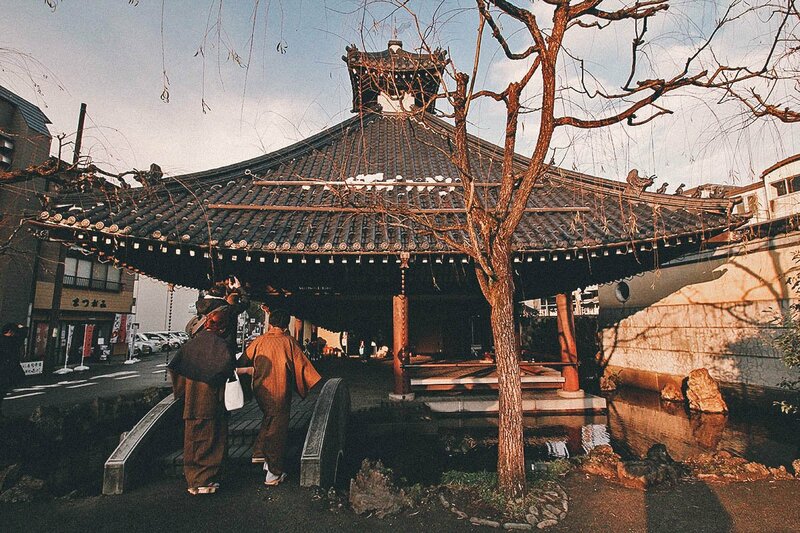 Kinosaki Onsen is two and a half hours away from either Kyoto or Osaka so it is possible to do it on a day trip. But why would you want to? You’d be spending five hours traveling in a train and more importantly, you’ll be rushed. 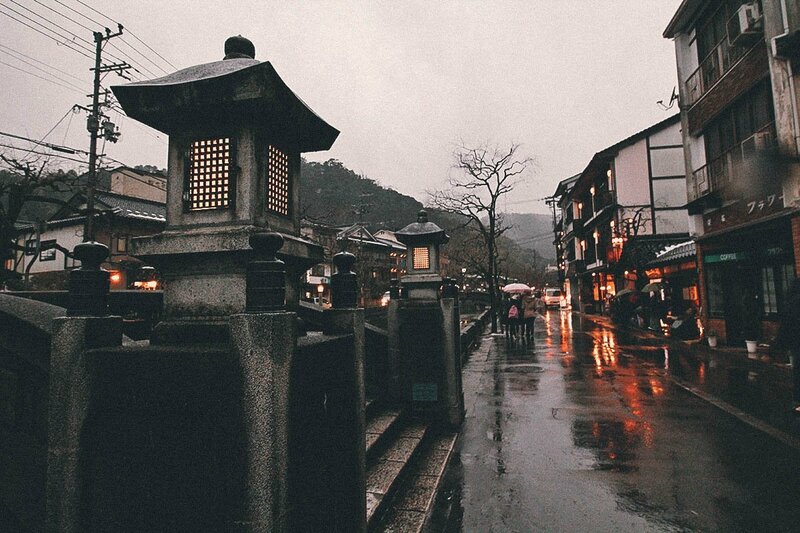 The point of an onsen town is to slow down, relax in your yukata and geta, and enjoy your time in the hot springs. It’s the kind of place that invites you to disconnect and soak up the atmosphere. You won’t want to feel rushed in a place like this so if you have the time, then I strongly suggest you stay the night. I’ve read that the town is at its most beautiful at night. You can check Booking.com or Agoda for suggestions on Kinosaki Onsen accommodations. It takes about 2.5 hrs to get to Kinosaki Onsen from Kyoto by JR Train. It costs JPY 4,320 each way for unreserved seats and around JPY 4,640 for reserved. The Japan Rail Pass and Kansai Wide Area Pass are valid between Kyoto and Kinosaki Onsen. Option 1: It takes about 2.5 hrs to get to Kinosaki Onsen from Osaka by JR Train. It costs JPY 5,080 each way for unreserved seats and around JPY 5,400 for reserved. The Japan Rail Pass and Kansai Wide Area Pass are valid between Osaka and Kinosaki Onsen. 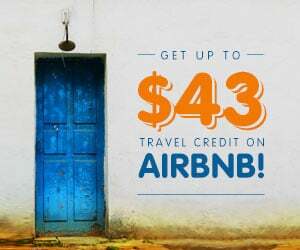 Option 2: A cheaper option is to go by bus. Zentan Bus operates 2-3 round trips per day between Osaka and Kinosaki Onsen. The trip takes 3 hours and costs JPY 3,700 yen. 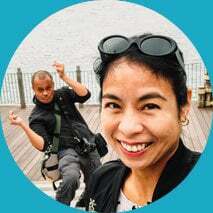 This trip was made possible by Cebu Pacific Airlines and JR West. We were guests of JR West and taken on a FAM trip to promote Kinosaki Onsen and Western Japan. As always, opinions expressed in this post are mine and mine alone. Some of the links in this post are affiliate links, meaning we’ll get a small commission if you make a purchase at NO extra cost to you. We really appreciate your support as it helps us keep this website going. Thank you! Japan is a charming city and it is also one of my dream place to live. Thanks for sharing this. How romantic, great shots! I love stories of less travelled destinations. 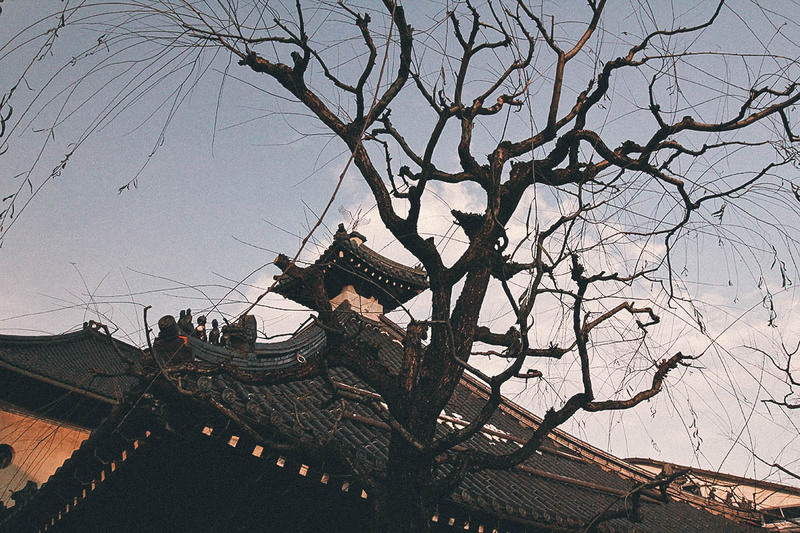 Japan is one of my favourite countries in the world when it comes to travel. I’m following the next Onsen towns posts. Love reading your blog. Thank you for sharing. Love your blog. 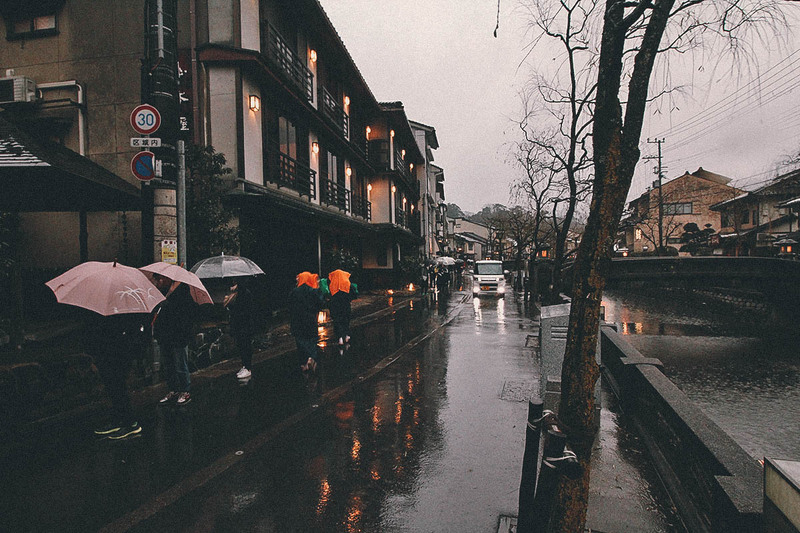 Going to Japan next month and reading your blog has got me sooo excited. Your photos are also amazing! Which filters do you use? Thanks ADC! Happy to hear that you find the guides useful. 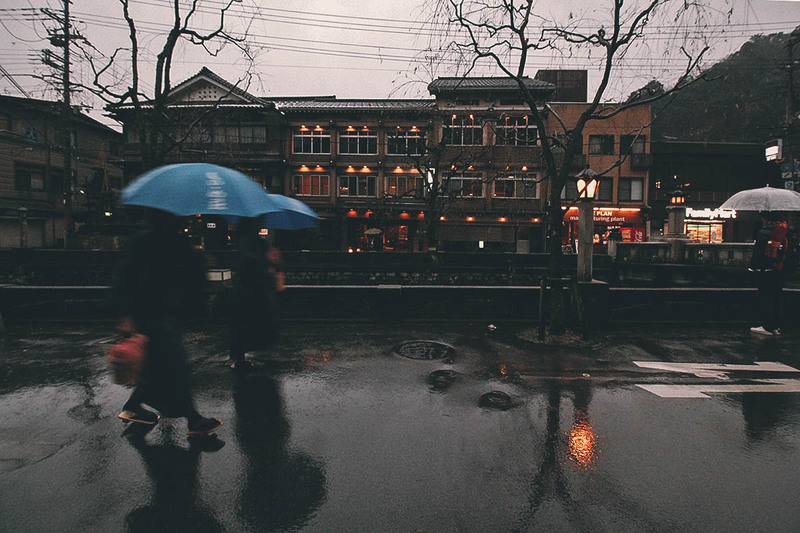 Hope you make it to Kinosaki Onsen. That place is awesome.